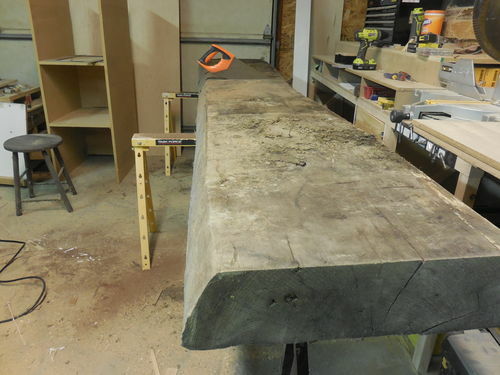 After acquiring a couple of 10 foot by 5 inch thick walnut slabs, I decided to chop 5 feet off of one to make this bench. I started by scooping out three seats, grooved the sides with my palm router, and then filled the cracks with epoxy. Designing the base was the hardest part. I wanted something custom looking, but also needed to allow for plenty of wood movement. I decided on this setup, which gives the appearance that the slab is sort of floating in between the legs. The base is 100% walnut as well. I finished it with four coats of wipe-on satin poly.Obviously, this is strictly an indoor bench. Really cool design. Very unique. Great looking bench, well worth all the work you put i to it. That turned out great, nice job. OMG look at the size of that slab! How does one just aquire material like that? You say you scooped out the seat area, just how did you do that? Gorgeous piece. That slab is beautiful and the design for the base is nice! I picked those slabls up on Craigslist. I had to dig them out of the mud, but well worth it. I “scooped” the seats by making exactly 201 kerfs with my power saw at various depths. (yeah, I counted) And then I used a large chisel and a belt sander to finish them off. Great design; very nice work; a real keeper. Wow, that is a beautiful bench! Amazing you found this beauty on CL! And at 150#, I bet it’s a back-breaker to move around!